zaha hadid design, the design branch of the acclaimed architecture firm, has developed a new sports underwear line that adapts to the anatomy and physiology of the human body. 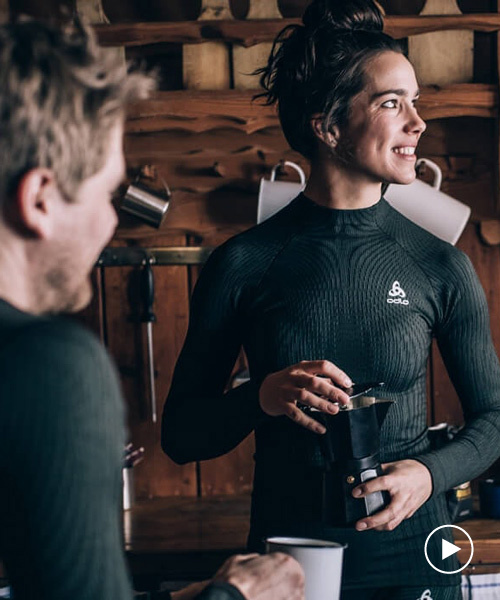 the garments have been created for, and in collaboration with, odlo, an international sports performance brand who are the original inventors of performance base layer clothing. developed in partnership with zaha hadid design, the odlo ‘futureskin’ base layer collection combines bio-centric ‘organic bodymapping’ with material innovation and design expertise to deliver climate control and natural freedom of movement for all sports activities. the clothing fuses zones of different temperature sensitivities, ventilation needs, and movement intensities using seamless knit technology that requires no bonds, seams, or inserts. the garments integrate varied knit construction to transition from zones requiring greater insulation, to zones where a higher degree of ventilation is demanded, to those zones where unlimited movement is necessary. designed to support the body and provide ideal moisture management, a thick tightly knit mesh is used where our bodies are most sensitive to temperature and need more warmth. meanwhile, a looser knit is used in areas like the knee and elbow joints that demand greatest freedom of movement. Common’ people…. I still can’t see the connection between Zaha design and a sports stretch garment . What’s next ? Maybe Armani Power tools ? ‘Must be prototypes… the collar is a mismatch on her closeup, sleeves are overly long. The joining seam is interesting; it is not flat-seaming …I hope it is not serging – creating a hard rib on the underside. Perfect moisture management; really? what does that mean as we all sweat during active sports. Organic bodymapping, bio-centric ? Im totally lost with these terms and I work with textiles. I watched this video as I wanted to learn what benefits these garments would offer me. I still dont know.